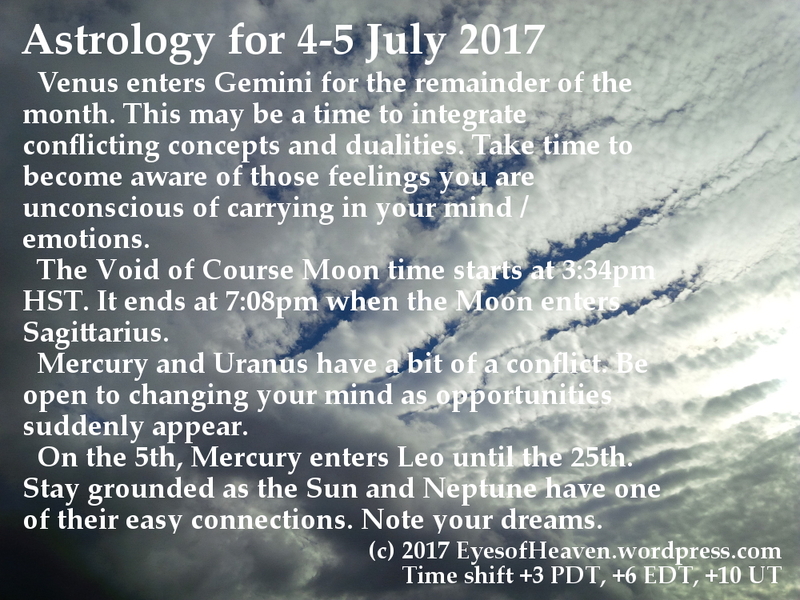 July 5, 2017 at 3:08 pm | Posted in Astrology | Comments Off on Venus enters Gemini, 2017! Interesting mix for this full moon with the Sun illuminating the Moon at 17 degrees Capricorn, Pluto a degree away from the Moon and currently retrograde forming a conjunct with the Moon and opposition to the Sun. Then we have Jupiter in Libra, forming a square to all three (albeit a few degrees off perfect square to each). The Sun opposite Moon is by far the strongest aspect, and Capricorn makes the energy results-oriented. It is a time to set [realistic] goals and impart energy to achieve these goals. Note that the signs involved with the aspects mentioned above are all cardinal signs – Capricorn (Moon and Pluto), Cancer (Sun) and Libra (Jupiter). Cardinal signs mark the official change of the seasons, and as such they reinforce the notion of setting new beginnings, and goals. 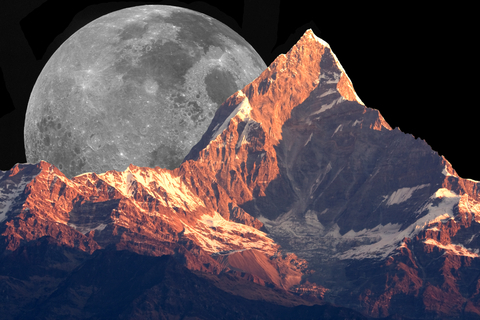 As the Full Moon in Capricorn approaches, you might be feeling some rather potent, possibly uncomfortable energy drifting around. Is your inner warrior rising up to the surface, possibly in ways that might not be entirely comfortable? Well, there is some big stuff going on out there in the heavens right now and although planetary energy doesn’t actually cause anything to happen, it does provide us with a weather report, so that we can prepare ourselves and choose how to respond… and the weather doesn’t really get more intense than this, so buckle up! Once a year, the Sun moves into an opposition with Pluto, which is happening right now. This year, the picture is more complex than normal, as Mars, the “don’t hold anything back” warrior, is locked into a fiery dance with the Sun and opposing compulsively intense and transformational Pluto. This is one of those times when Love really is the answer, otherwise this Full Moon at 17° 09′ Capricorn on 8 July 2017, 09:07 PM PDT, could turn very dark. The Capricorn Moon conjoins Pluto opposing the Cancer Sun conjoined by Mars with both widely square Jupiter in Libra. The saving grace is Neptune in compassionate Pisces harmoniously aspecting both luminaries. Late today Mercury leaves sensitive Cancer for boisterous Leo, and that officially tips the elemental balance to the fire/air side. Perspective begins to return and we can be more objective in our thinking. Mercury in Leo is wonderful for inspiring our creative side as well as being more playful. The MOON has galloped into SAGITTARIUS early this morning to bring high adventures, swashbuckling exploits, and good spirits. The energy will be expansive, optimistic and “Summertime and the livin’ iseasy.” like George Gershwin wrote. Ok Not for you folks Down under, sorry. Share some laughs, hang with the guys, go hiking, learn something new. Honest to a fault Sagittarius may nail those flirty little two-timing Gemini’s to the wall. A good time to talk politics, although you have to be careful what you say these days. Philosophy, history, mysticism is all Saggy heaven. Opposites attract. Snapshot: Wednesday holds Soulfully Karmic expression along with clarity around the Higher Mind adjustment of Jupiter and Neptune. The first 3 aspects has Mercury aspecting the ‘Heartbreak Transit’/ ‘crisis of faith’ players: Chiron and Saturn. With Saturn as the linchpin, Mercury also meets both Karmic players: Saturn and Neptune. Its a great day to pay attention to what you say/write or hear. At 5:32am Mercury at 28:51 Cancer Trines Chiron at 28:51 Pisces. This is a Soulful expression around family that soothes some of our ‘crisis of faith.’ If there has been any hurt with family members since Dec, use this aspect to offer some words that offer healing here. Chiron can show Mercury where he has been 2-faced towards family issues and help him to ease into a more convergent mode of thought. At 8:21am Mercury at 29:04 Cancer Biquintiles Saturn Rx at 23:04 Sagittarius. Cancer Sun forms trine aspect to Neptune. The Sun forms a challenging square aspect to idealistic Jupiter. Today we can anticipate powerful energy shifts as we have a fair bit going on in the sky today! Optimism and expansion are key words for today. When you wake up today the Moon would have left the deep emotional space of Scorpio behind to enter adventurous , fun-loving Sagittarius, which is known to be the sign of philosophical expansion and exploration. Separation, is to separate a compound into unique substances. Leaching salts from ashes. Filtering solids from liquids. Pressing oils from solids. 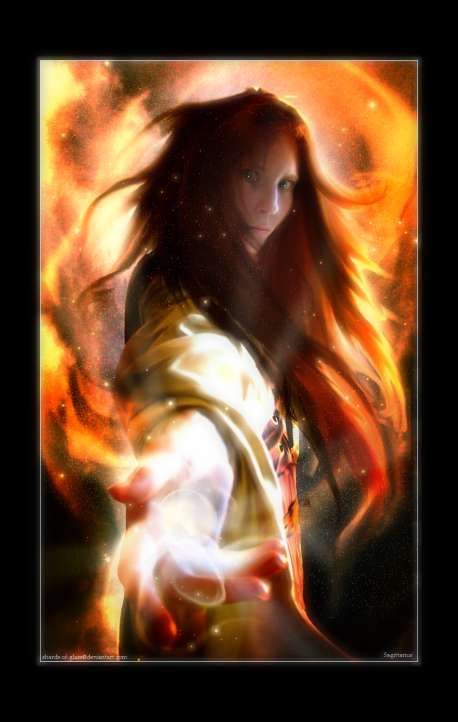 A good time to: be open and receptive; holding on to what works is easier than normal to spot. Challenges: obligations; ‘duty first’ is ticking in the background of the mind, at the same time there’s a fog of impulsive disregard for coloring in the lines. Balance: truth; be aware of those aspects that never change, they’re probably the true reality.